This flat is great for a medium-sized family of up to 6 people who are looking for a relaxing vacation by the beach. Located just two blocks away from a historic beach (Ocean Beach), it is a spacious 2-bedroom, 2-bath flat with a large dining room, fully-equipped kitchen and hardwood flooring. The flat has a long hallway and all the rooms have a flat-screen tv with basic cable channels. Want to go downtown to shop or enjoy the exciting nightlife? Hop on the train that is one block away. Want to stay and explore the neighborhood? You are blocks away from the beach, Golden Gate Park, grocery stores, cafes, and popular eateries (Beach Chalet Restaurant / Brewery, Cliff House, and Thanh Long Restaurant). Biking and hiking trails and horseback riding are nearby. Major tourist sites are also close by, including the de Young Museum, the Japanese Tea Garden, the Academy of Sciences, and the San Francisco Zoo. 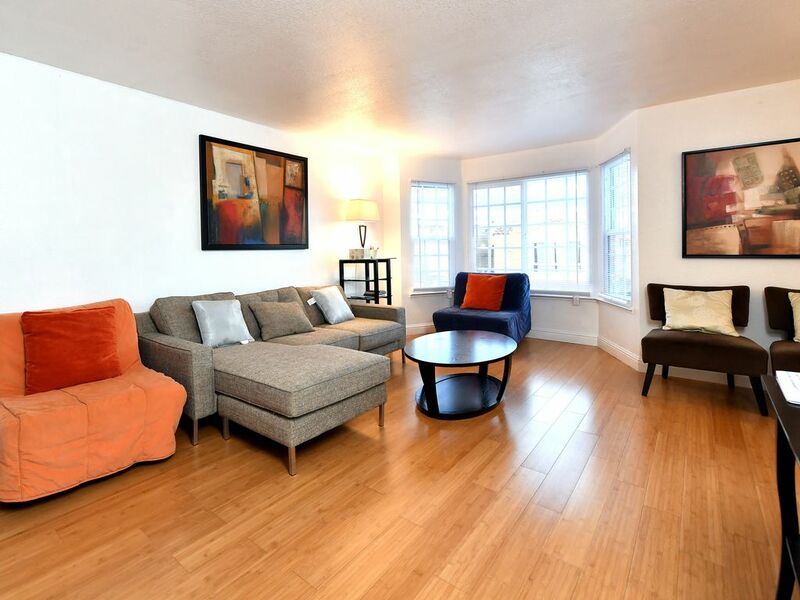 Other amenities include: parking garage, in-unit washer/dryer, wireless internet and basic cable. I'm married with two young kids. I've lived in the San Francisco most of my adult life and love it, especially its diversity in culture, architecture, food, outdoor lifestyle, among many other things. The home was large and has 2 full baths which is such a plus. The garage makes all the difference in the world with parking being so tight if you have a car! It had every large and small appliance you need. The owners are very responsive as well. Highly recommend this place for any stay in San Francisco. Very large, bright place to stay. Easy to get around. Nice fully equipped apartment. Stacy was very fast and easy to communicate with. Great location. Safe area. Two coffee shops in a block walk or less. Clean, spacious, plenty of room for 2 adults and 4 teenagers. Great distance to explore the city every day. Great location - can easily walk to the beach, Golden Gate Park, a couple of very good restaurants, and the organic market. We took an uber to all the sight seeing locations - very easy. Don't drive, parking is expensive & almost nonexistent in the tourist areas. The apartment was quiet, clean, and was very well stocked w/ spices, towels, napkins, laundry detergent etc. Stacy & Kenny were super helpful and accommodating. Perfect place for families visiting San Fran! Stacy and Kenny have a very spacious flat in a quiet but convenient location. We appreciated their thoughtful essentials and all the amenities their flat included. They were quick to answer our questions and ensured that we were happy with the accommodation. We would stay here again for sure! If you are looking for a place for two couples that doesn't feel cramped, this is it. Great value and a great amount of space. Check-in was very easy and the owners were very responsive! Very close to the MUNI train and there are great restaurants within walking distance! The garage was very nice for parking as well. Highly recommend this property for San Fran!